Intra-Abdominal Pressure: Pelvic Health Friend or Foe? Lorraine: Why do certain exercises such as Crunches and Deadlifts cause excess pressure in our system that often results in a weakness? Julie: This is a great question, because I think the conversation about intra-abdominal pressure (IAP) is starting to change or should change. 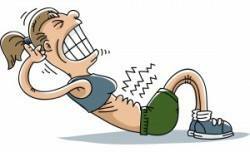 I am admittedly one of those that have barked about no crunches because of the increase in intra-abdominal pressure. However, some recent studies have given us some new information that may help us understand better how to make recommendations on previously taboo activities. Two studies, Cobb et al 2005, and O’Dell et al 2007**, measured the pressure created by a variety of activities (cleaning, jogging, small lifts, Yoga positions, jumping, crunches, etc.). In both studies, the participants demonstrated a wide range of values for each task. Meaning that some of the participants were able to perform tasks with little pressure increase, while others demonstrated large increases. For example, the range in the O’Dell study for crunches was 19-76 cmH2O compared to 26-72 cmH2O for a downward dog position in Yoga. I think that is a pretty amazing comparison, because Yoga usually doesn’t come up in these conversations. Yoga’s safe right?! They also gave results for a crunch with exhale. The range was 8-75 cmH20. The exhale eased the pressure for some, but not for others. What gives? The authors discussed, and I agree, that the explanation for the large ranges was in HOW the participant performed the activity. This speaks to things like form, muscle recruitment order, breath holding, etc. So HOW folks lift, run, jump, crunch, downward dog, etc can elevate abdominal or pelvic pressure above what their pelvic floor can resist*. OR they can perform the activity in a way to reduce their pressure. (*Please note this doesn’t necessarily mean that the pelvic floor is weak or weakened by the pressure. In many cases it is that the system is out of balance or uncoordinated and the PF just gets overwhelmed. It sort of gets ganged up on). Does that mean I think everyone should start doing crunches? Nope. Lots of women, particularly post-partum, have very poor form and muscle recruitment patterns. Thus, they may be crunching at the top of the pressure range without some guidance. Do I think women need to learn how to do these activities in a way that reduces or manages IAP (keep the activity in the lower part of the range)? Yep. Do I think that is possible….absolutely! Do I think that means everyone can? Hopefully! But in some cases crunches (or downward dog) may not make it back on the docket, because some may not be able to balance the pressures with their available structure or muscular work. So we move on to other activities. There are other ways to develop central strength, activities I like much better than a crunch. The takeaways here are many. The biggie for me is that women who are committed to their sport or fitness need to understand, if you are experiencing a pelvic health issue (prolapse or incontinence, or hip or low back pain) during your activity, figure out why. It may simply be that your form, habit, muscle recruitment pattern or imbalanced fitness routine (all abs, no back or bum work) is maintaining elevated intra-abdominal pressures or a weak link in your chain. There is help….find a practitioner near you. To continue reading the full interview, click here. Want to learn more about treating or training Female Athletes? Check our online courses here.